Literary Wives: Meg Wolitzer’s The Wife – The Bookshelf of Emily J.
I began this novel with a sigh. After reading the first few pages, I thought, “Not another novel written from a female perspective that is all about how important her husband is.” I wanted to read something about an actual wife, not a wife just telling us about her husband. Well, it turned out that the book had just that in store for me. 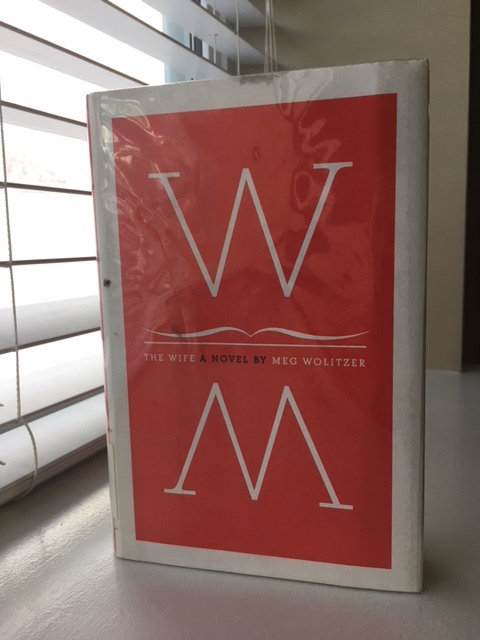 The Wife (2003) by Meg Wolitzer is the focus of the Literary Wives Series this month. Please see more of the Literary Wives discussion at the following blogs. We read a novel about wives every two months an answer a question: What does this book say about wives or about the experience of being a wife? My disappointment came when Joan would not admit it. Joe’s biographer suggested that he knew the truth. He asked her about it. She was going to tell him just before her husband has a heart attack. And then she backtracks. She self sacrifices and tells the biographer that she did no such work. Joan allows herself to once again be subsumed in her husband’s larger personality. And that is what this book says about being a wife. All along, we readers suspect that she is more talented and more involved than she lets on. We wonder if their own son suspects the truth. Once we reach that truth, she denies it. She keeps it a secret. She remains second fiddle. This message bothered me, but it also rings true. I realized that the ending of the book is authentic because of her reaction, her willingness to keep the secret. I wanted her to break free and speak out. But she didn’t. She is THE WIFE. It is her role, and she plays it to the end. However, her decision to keep the secret is a little surprising. While traveling to receive the award, Joan decides that she is going to divorce Joe. She realizes that they are done, and she imagines his award limelight as intolerable. “Soon he would gloat and preen and discuss his triumph nonstop, inflated with ecstasy and self-importance” (p. 37). There is some jealousy of his acceptance of the situation, of his public willingness to play the part of great author. It seems that at times she wants some of the credit, or she at least wants him to not be so puffed up about his success. Yet she repeatedly tells him not to thank her publicly. She finds it humiliating. Yet Joan learned early on in their relationship—she is his second wife, born of an affair they had as teacher and student—that women aren’t taken seriously in the literary world. As she followed aspiring Joe to readings and events, she hears and sees the truth of literary culture. One aspiring female author warns her that men control reviews, publishing houses, papers, and magazines. They get to decide “who gets put up on a pedestal for the rest of their lives” (p. 52). Maybe her façade of Joe is the best hope she has for literary success? Maybe that’s what she decided. She puts up with his infidelity. He has many lovers over the years. And Joan knows it. At first I was puzzled by her tolerance of it, and then I realized what was really going on, that Joan was not his muse but his actual writer. The other women wrote “bad fiction” and they could not give him what Joan could. That seemed to be the reason for her confidence in the situations and her reason for staying in the marriage. They needed each other to continue to pull off the literary success. Some of the other interesting tidbits about wives from the book ring true as well. Joe once said he felt sorry for women, “who only got husbands” (p. 32). His reasoning was that wives are caring and do so much, but husbands only give advice and try to apply logical force to every situation. I have felt this way at times. I’ve said, jokingly and not-so-jokingly, “I wish I had a wife!” When Joan meets the president of Finland’s wife, she thinks she hears her say “My life … is so very unhappy” (p. 181). It seems to be a theme for the women who are wives in this novel: unhappiness. I hope that isn’t necessarily true for everybody who is a wife. I dont think I really understand! I dont think the conclusion drawn “It seems to be a theme for the women who are wives in this novel: unhappiness” is justified. There are unhappy husbands too. Happiness is not anyone’s monopoly. Everybody has the right to be happy or unhappy! Some people are able to make the choice …on others choice is thrust by circumstances /society! Well, I think it is justified for the women in the novel. Outside of the novel: hopefully not so much. I agree that there are unhappy husbands, but they were not portrayed in this novel. It was very one-sided, from the wife’s perspective, and her husband seemed to have it all. But you are right. In real life, there is more to the story! Thanks for responding Emily. Your blog is very informative. Agreed that happiness versus unhappiness is a choice. However, keep in mind that many of our choices are affected by our societal conditioning, and certainly women born pre & shortly post WWII were insidiously conditioned by societal’s expectation of the female role…..there were a percentage of women who were able to think outside-the-box, but that was a smaller (although helpful) percentage. We don’t live our lives in a vacuum, so we must take into account what make be lurking in the background of not only spoken, but also unspoken conditioning. It sounds like “The Wife” was coming from that perspective of that time. I completely agree! It has been a few years since I wrote this, and I know that so many of us can be trapped in circumstances because of society’s norms and contexts. Interesting review. I will read the book and respond. I am a happy wife but have many thoughts about the unhappiness I have seen in women who are wives, and which is, I think, somewhat pervasive in literature. I am reading Mrs Dalloway at the moment, so this has struck a chord. Yes! I think you are right about it being somewhat pervasive in literature. I think unhappiness makes for a better story: there is conflict and maybe some bit of resolution. The fact that she keeps the secret in the end says a lot about her, doesn’t it? And I don’t think she’s only protecting her husband, but might also be thinking of her children. And maybe she realizes that she still has time to write her own stuff now that her husband is gone, and now that women writers are more accepted. It made me wonder what I would do in the same situation. And, honestly, I think I would have done the same. The author must have done a good job of writing Joe as a sympathetic character despite the fact that we knew all he was up to, because I even found myself cringing at the thought that Joan was about to expose him. I don’t know what that says about me! But it’s also interesting to compare that to the way I felt about Gil in Swimming Lessons by Claire Fuller (which I read around the same time). He was also an egotistical writer who cheated on his wife, and I had almost no sympathy for him at all. It could be because Joan seemed more content with her marriage than Gil’s wife did – she was pretty miserable. So many things in this book rang true, which made it fun to read. I especially loved what she had to say about the marital reflex of asking your spouse how they are, even if you don’t really care. I find myself doing this sometimes, and I’m sure my husband does too! This was a fun read, and I was torn when she threatened to reveal the secret. I wanted her to, but it did feel like a huge betrayal, not that Joe was without fault. I almost think that keeping the secret was a form of self preservation. Would anybody have believed her anyway? The biographer didn’t seem to be well respected, and I suspect her telling a story like that, especially after Joe died, would have been hard to believe. Ridiculous, even. I wonder if that had something to do with it as well. And yes, I spoil. I love to spoil! I hadn’t even thought about the fact that people might not believe her. I like to think that she has gone on to write some of her own books! I tried not to give away the ending, too, while recognizing that this made my comments a little more mysterious. I was disappointed in the ending, but I could see that she had set herself a trap. After her husband is dead, she can’t very well claim his work. Did we feel that she would try getting her own work published or did it seem as if she wouldn’t try? That I can’t remember. It’s interesting, now that you’ve mentioned it, that she would put up with his infidelity considering that she really held the power to remove his literary career. I also noted that even though his career was based on a lie, he became complacent, just as if he had written the books himself. Yeah, it is interesting that she put up with his infidelity. She could have wielded a little more power, but maybe it wasn’t worth it to her. I don’t think the book ended with the hope that she would start doing her own work, but I could be wrong. And yeah, his death trapped her with the secret for sure. No, I agree. I don’t think she was planning to. It was a discouraged ending, but perhaps more realistic. Your review reminded me of a film from a few years ago, “Big Eyes,” the true story of Walter and Margaret Keane. He was a fabulously successful artist back in the ’60s, until it was revealed that the artist was actually Margaret. They divorced messily, and she went on to a career or her own. Every time I read one of your Literary Wives reviews I think of a book I reviewed back in May of 2014, “The Headmaster’s Wife,” by Thomas Christopher Green. Your group should consider it. Like this Wolitzer book, the clue to the whole thing is in the title. Interesting! I had no idea this was a real-life phenomenon. I wonder how many other women’s art and voices have come through their husbands? That would make a fascinating research project, but maybe those instances would not be provable. I’ll have to check out The Interestings. And yes, I’ll mention to the group The Headmaster’s Wife. Thanks! Emily, when I first scanned your post in my inbox, I thought “I began the novel” meant that you were writing one yourself. So I then exclaimed:”How exciting! When can we read it?” Having said that I always look forward to your posts and can see the great role you, and others, are playing for the voice of women in literature and in authoring such texts. Your review of this book reminded me of the ‘Big Eyes’ movie too. It’s a good film with a fascinating story. I think you would enjoy it. I kinda sorta “spoiled” in my review. I also wondered if she would have been believed if she had told the truth after Joe’s death. But honestly, I so wanted her to reveal the truth!! But those poor kids! Especially the son! How would he have handled it, knowing that both of them, but especially Joan, had specifically lied to him when he was obviously upset beyond belief, feeling that he knew the truth! Ack! That’s what happens when you agree to live a lie…in my opinion, many people get hurt. I couldn’t believe she was willing to lie to her own children as well…to me that was the major betrayal! Though I can see how you get trapped sometimes. I did in my first marriage, though if I’d not had children to raise, I “believe” I would have left within the first 5-10 years. But who knows? We don’t know until we get there…IMHO! No, all wives aren’t unhappy but realistically, happiness & unhappiness are part of our life cycle. Contentment & peaceful joy are much more permanent and stable marriage goals. But it sounds like this marriage started in deception & illicit, clandestine relationships, so, it continued in the manner it was born. Thank you for sharing your story! I love that you did end up “using your brain.” I liked the movie too. I hope you like the book!